With growing concern over the use of with artificial colorants, flavourings and preservatives in our children’s food – should we not also be concerned for our fur babies too? Dogs are a captive audience. They have no choice but to eat what we give them, day in, day out, year in, year out. Over this kind of a length of time, artificial additives – many of them thought to be cancer-promoting – accumulate in the dog’s body. Over and above the increased risk of cancer, the dog’s liver and kidneys have to try and deal with all these unnatural compounds, which can also lead to long-term problems. And if you thought the level of artificial chemicals in our food was bad – remember that dog feeds are almost always labelled – ‘not fit for human consumption’. If you can’t eat it, what on earth is it going to do to your best friend? But, help is at hand! (or paw, should I say.) 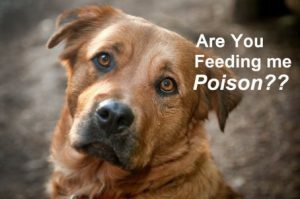 Here we look at the do’s and don’ts to examine ingredients lists for dangers, known or suspected, and how to mitigate the risk to your precious pooch. There is no legislation or requirement needed for a company to label their dogfood with terms such as ‘premium’ super premium’ ‘ultra premium’ or ‘gourmet’ – to be entirely honest, these are just marketing gimmicks to get the consumer to hand over more money for a company’s product. To actually provide a better food for your dog, you need to look for labels which actually require adherence to certain standards to be used lawfully. ‘Natural’ Foods – this labeling is enforced by the Association of American Feed Control Officials (AAFCO), which is the regulating body for pet food manufacturers in the US, and is pretty self-explanatory. This labeling requires that the food contain no synthetic or artificial compounds, and only plant, animal or mineral sources (in the case of additives such as calcium, magnesium etc.). This means that chemically synthesized ingredients such as preservatives, colorants and artificial flavors cannot be included – a big step in the right direction. ‘Organic’ Foods – this labeling requirement is quite similar to the use of the term in human food products; and means that the pet food is made without the use of pesticides or artificial fertilizers for the plant components, and that any animal products used are from organic sources as well – meaning that food animals are raised without the use of antibiotics or growth hormones, and fed with healthy feed themselves.This labeling also requires that no exposure to human or industrial waste contaminants occurs, and that food is not processed with radiated additives. Requirements are: ‘made with organic ingredients’ – use of this labelling requires that at least 70% of the products content is from organic sources; ‘organic’ – means that at least 95% of the sources are so; and ‘100% organic’ means that all ingredients used are certified as organic. DON’T – Buy food with artificial preservatives. Preservatives are a tricky element when it comes to dog foods, especially kibbles or pellets. Because these products are designed to keep for long periods of time without refrigeration, and yet contain animals fats, oils and proteins which can go rancid and become toxic, preservatives have to be used to ensure the food doesn’t spoil. There are natural preservatives such as vitamin C and E which can be used, however there are certain artificial preservatives which we know to be dangerous. Ethoxyquin – not only is this preservative associated with blood and liver problems, but is actually used as a pesticide, and in the chemical hardening of rubber. 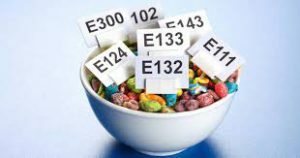 Ethoxyquin in food items is actually banned in most European countries and in Australia. Not something that any animal should be consuming! BHA and BHT – Butylated hydroxyanisole and Butylated hydroxytoluene are suspected to be carcinogenic by the World Health Organisation and are under investigation. However these compounds are still disturbingly common in many brands of dog food. TBHQ – Tertiary butylhydroquinone. This preservative is especially controversial, as it also an anti-oxidant, which one would associate with being a positive thing, and is also found in many human foods! However there is concern that it may be correlated with cancer through causing DNA damage, and there just aren’t enough long-term studies to demonstrate its safety or otherwise – so better safe than sorry with this one. Propyl Gallate – this compound, although considered safe by the FDA, is worrying because of its potential link to reproductive issues such as breast and prostate cancer in humans. Feeding a food which contains this on a daily basis to your dog, every day, is much better avoided. Propylene Glycol – this preservative is banned in cat food, and is used as a key ingredient in antifreeze. The same goes for ethylene glycol which is even more dangerous. Enough said. DON’T: – Be fooled by names such as ‘chicken dinner’ ‘beef flavoured’ ‘chicken meal’ or ‘with fish’. These are all ways to allude to a healthy-sounding food without basis. A food named ‘dog food with chicken’ is only by law required to contain 3% chicken! Similarly, naming a food as a ‘meal’ or ‘dinner’ means that only a component, and often not more then 25%, comprises the named ingredient. Something called ‘beef flavour’ may not even contain beef at all! DO: – Use the 95% rule – here is where labelling can be your friend. If an item is specifically labelled as ‘Beef dog food’ – it must contain at least 95% beef. If two meat ingredients are named, such as ‘beef and liver dog food’, then both ingredients together must make up 95% of the food, with beef being the larger component. DO: Opt for larger brand names. While it may sound counter-intuitive, and that a smaller or home-industry food may be prepared with more care, 93% of food recalls originate from smaller companies who often just don’t have the resources to obtain proper certifications or conduct their own quality testing. Of course, another way to ensure that your dog is limited to exposure of all of these chemicals, and from natural components, is to make your own! 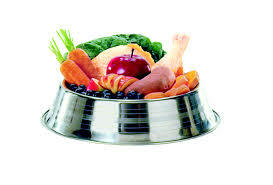 Have a look at our article (50 Homemade Dog Foods You can Easily Prepare) for some ideas. However, it’s not always viable or practical to do so, and most commercial foods will at least give you the peace of mind that your dog is getting a balanced food designed to meet their nutritional needs. So opt for foods that as labelled as Natural, and ideally 100% Organic. Yes, these foods do come at a price. But if you do the maths, what they cost per meal compared to your food is still significantly cheaper. And knowing that you are doing right by a companion who serves and loves you with such trust and loyalty is, of course, priceless.